This inferencing activities program focuses on teaching your students inference and thinking skills. Inference is a vital skill that students need to comprehend stories, advertisements, newspaper articles and pretty much all written fiction. The book is ordered into individual chapters that your students work through at their own pace. This comprehensive program assures active participation from students. After reading a scenario, students are prompted to look beyond surface details in the text and find the hidden meaning. This requires your students to use their inferencing ability, an essential reading comprehension skill. 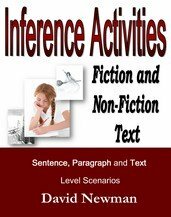 The inferencing activities workbook is an easy to follow manual that has been designed to engage your students with high interest scenarios. Each scenario contains several questions which cleverly prompt your students' thinking and problem solving skills. 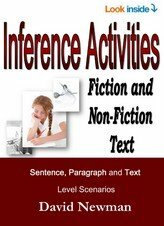 The inference activities workbook is appropriate for any child who wishes to improve their reading comprehension skills. Inference activities featuring pictures and text with unique illustrations hand drawn by the author. Inference activities at sentence level - featuring time, location, what, who, and why questions. 100 paragraph level non-fiction scenarios with over 200 questions. 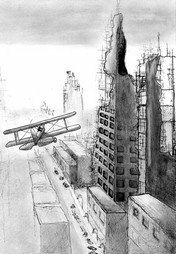 100 paragraph level fiction scenarios with over 200 questions. Extensive answer section in the appendix. Please click on PDF download to access table of contents and a free chapter complete with answer section. The Inference Activities Program is suitable for students aged between 8-12 years of age. Available as an Adobe PDF download direct to your Computer. The adobe PDF file enables you to download the ebook file directly to your computer's hard drive, where you have the option of printing the entire book, or individual chapters almost immediately. The Sentence in Reading Comprehension program is a 143 page ebook. The program features excellent user-friendly exercises that unlock some of the mystery about sentences and sentence construction. Features a dictionary alphabet guide. The program has an extensive answer section in the appendix. When you click through to the order page, look for the green in the address bar at the top of the page, and the little padlock. The green in the address bar is the symbol for high quality security.. The process is pretty much hassle free. After you click on the buy now button, you will be directed to a secure order form where you will be presented with the option of paying with either paypal or credit/debit card. contact me and I'll give you a hand.